WEN's Volumizing Cleansing Conditioner. "by Chaz Dean". CLEANSING CONDITIONER. 32 fl oz w/ Pump. X-LARGE 32 oz Bottle w/ Pump . WEN by Chaz Dean Duo. Manufacturer Sealed - Includes Pump. =================================================================. 16oz bottle. Lavender Cleansing Conditioner Brand new Never opened . Shipped with USPS Priority Mail. 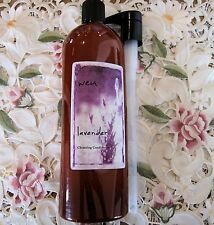 Wen Lavender Cleansing Conditioner 16 oz. New Sealed Bottle! 5 out of 5 stars - Wen Lavender Cleansing Conditioner 16 oz. New Sealed Bottle! 119 product ratings119 product ratings - Wen Lavender Cleansing Conditioner 16 oz. New Sealed Bottle! Wen cleansing conditioner lavender. Condition is New. Shipped with USPS Priority Mail. You will receive 2 bottles. New and Sealed with Pump. 16 Fluid ounces. Sealed bottle. WEN's Volumizing Cleansing Conditioner. "by Chaz Dean". CLEANSING CONDITIONER. WEN Lavender Cleansing Conditioner 16 Fl Oz/New sealed. Condition is New. Shipped with USPS Priority Mail. PACKAGE HAS SOME WEAR. STILL NEW SEALED. SEE ALL PHOTOS. THANK YOU! New Stock Mint in Box Wen Chaz Dean Cleansing Conditioner "lavender"
WEN Chaz Dean Cleansing Conditioner *Shampoo Replacement* 32 oz Choice of Scent! Opened without plastic but unused. I opened the bottles to smell & decided it was not for me as I am very peculiar with smells & senses. It has a great smell for those loving lavender. I have lowered the asking price based on it being not sealed but unused. WEN by CHAZ DEAN. Manufacturer Sealed - Includes Pump. =====================================================================. WEN Lavender Re Moist Hydrating Hair Mask 4 oz. 1 NEW~~NOT SEALED~~. 1 USED MISSING ABOUT 4oz~~SEE FILL LINE ON BOTTLE. 2 new sealed 16 oz bottles with new pumps. 32 oz's total. See pics for details. You are looking at a new Re-Moist Hydrating Intensive Treatment Mas in Lavender by Chaz Dean. This is an unsealed 4 oz jar as it came as part of a kit. Please check all pictures and ask questions before bidding. I ship only within the U.S. and payment is expected within 3 days after the end of auction. Please check out all pictures and ask questions before bidding for there are No Returns on this item. Thanks for looking and please check out my other items. Wen Lavender Re Moist Intensive hair Treatment 4 oz. New Sealed Bottle! Wen by Chaz Dean. CLEANSING CONDITIONER W/PUMP 32OZ. I actually use Wen by Chaz Dean Hair & Body Care Products! and Promoter of WEN by Chaz Dean HAIR & BODY CARE Products. May b used as often as necessary to aid in strengthening hair follicles. 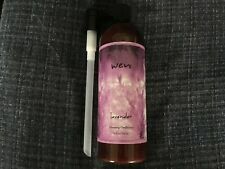 WEN by Chaz Dean Super-size 32 oz LAVENDER CLEANSING CONDITIONER w/Pump, NEW! CLEANSING CONDITIONER with Pump. Super Size: 32 fl.oz. AUTHENTIC / SEALED NEW (Under cap) / Un-boxed / As Pictured. New sealed with pump (not shown) but will be included. WEN by Chaz Dean Cleansing Conditioner. The bottles are a little misshapen due to side storage.